We were at the Roostertail with our Michigan disc jockeys for local Tri Delta Detroit sorority formal. If you have never been to the Roostertail then you are missing out. This location boasts beautiful views of the Detroit river in MI. They have multiple levels and offer superb service. In addition to their venue rental and catering service, you can also hire the Roostertail for centerpiece arrangements and decor. They really take events to the next level. We always have a great time when doing Greek events for Universities. This was their end of the year bash, which made it that much more anticipated. The sorority formal is an important night where sisters will invite their date to accompany them to the ceremony. There is usually some type of award process. The University of Michigan tri-delts decided not to do this. The meal began as the sun dipped over the horizon. I remember playing Sweet Caroline and everyone started to sing the lyrics from the top of their lungs. There had to have been over 200 guests in attendance. Majority of them were Greek from other organizations at the University of Michigan Ann Arbor campus. Once the meal ended, it was time to do what we do best. We had no problems getting their dance floor packed, and keeping guests entertained. The planning committee did a great job in selecting songs to play throughout the night from our client access area. We also gave Pick n Play access to guests to get them involved with song choices. I have to say that the music was a pretty good music. Towards the end of the night it tended to be more of a Top 40 list. Guests had a stellar time, you can tell from the photo above! In addition to some of the great shots we took, there was a photographer there to capture anything we missed. Encore DJs received rave reviews from the sororities planning committee. Our main point of contact was Aliene. You can read more of her actual testimonial at this link here. I’m a big fan of thank you notes. They loved all the tools we provided to help with organizing their event. 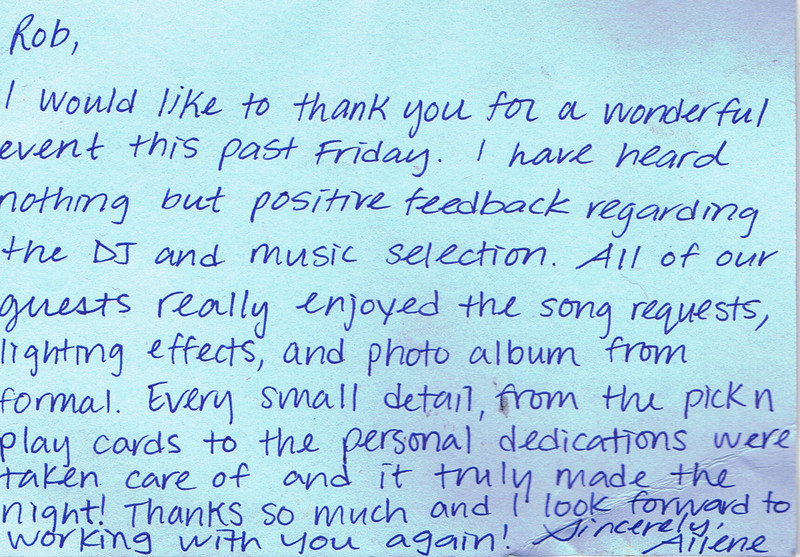 It is a great reminder of how rewarding our job can be when we get to know our clients. If you came across this post and need help with planning your event, contact us now. We make it simple to check if you date is available, just fill out the form above to get immediate disc jockey pricing. Finally, if you need entertainment or are looking to bundle services, start by clicking the image below.